Buying bitcoin with a credit card was once, just a few short years ago, a nearly impossible task. The exchanges that offered bitcoin didn’t want to be connected to the established, traditional financial system and the credit card companies didn’t want to be connected to bitcoin, thinking that it was a currency for criminal types. Fortunately, most exchanges have come to trust traditional financial firms, and the banks and card companies now know bitcoin isn’t used by criminals and other unsavory persons. Today, you have a number of ways to buy bitcoin with a credit card. Below we’ll show you where, and give you step-by-step instructions on how to complete a credit card transaction for bitcoin. Because of banking laws, most bitcoin exchanges don’t deal in fiat currencies, but there are several that have become compliant and can offer bitcoin in exchange for U.S. dollars. It’s still most common for the exchanges to operate with bank transfers as the primary method of payment, but a growing number are coming to accept credit cards. 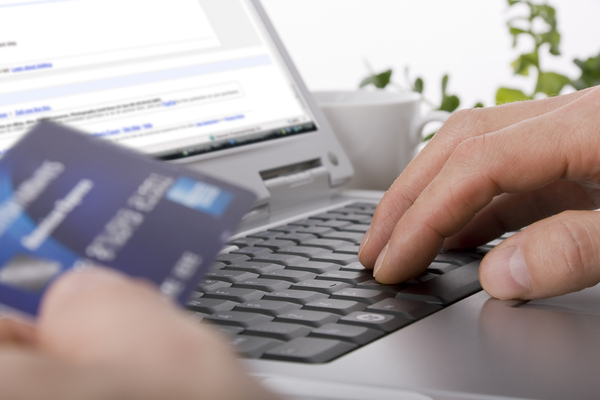 Conversely, some exchanges have moved away from credit cards. Coinbase, one of the largest U.S. exchanges, removed the ability for its customers to add new credit cards in February 2018. Customers who have cards linked to their account can still use them, but no new cards can be added. The company said it made the move because it was unable to ensure customers would have a positive experience when purchasing with a credit card. Probably the biggest obstacle to buying bitcoin with a credit card is the credit card issuers. As you can see in our FAQs about Buying Bitcoin with a Credit Card, there are a number of banks that have banned purchases of bitcoin with credit cards they’ve issued. The commonly accepted reasoning for this is the banks are waiting for regulations to emerge that will protect consumers and the banks. Even with all these hurdles, it’s still fairly easy to buy bitcoin with your credit card if it’s issued by a bank that allows bitcoin purchases. Below is a guide to buying bitcoin with a credit card from Cex.io or from CoinMama. Cex.io is one of the older exchanges around, having begun in 2013 as a bitcoin exchange and cloud mining provider. The cloud mining services have since gone away, but the exchange remains. It is based in London but offers its services worldwide. Technically anyone can buy bitcoin from Cex.io with a credit card, but in practice, some countries are prohibited from doing so. You can see that list here. Cex.io also isn’t available in several U.S. states. These are Alabama, Alaska, Arizona, Arkansas, Colorado, Florida, Georgia, Guam, Idaho, Iowa, Kansas, Louisiana, Maryland, Michigan, Mississippi, Nebraska, New Hampshire, New Jersey, North Carolina, North Dakota, Ohio, Oregon, Tennessee, Texas, U.S. Virgin Islands, Vermont, Virginia, and Washington. Note that there are two ways to buy bitcoin from Cex.io. The first and easiest is through their brokerage service. This is also the most expensive, with a fee of 7 percent in addition to the 2.99 percent credit card fee. More advanced users can buy bitcoin with a credit card through the Cex.io exchange platform, which still has the 2.99 percent credit card fee, but has a much lower exchange fee that begins at 0.25 percent and goes as low as 0 percent. To keep things as simple as possible, this tutorial will cover the brokerage service at Cex.io. Here you can choose how much bitcoin you’d like to purchase. New users who have only gone through the basic identity verification can buy as little as $20 and up to $1,000 of bitcoin per day. There is also a $3,000 per month limit for basic users. Those who verify their address can purchase up to $3,000 per day with a $30,000 monthly limit, and if you submit your government-issued ID, you can purchase up to $10,000 per day with a $100,000 monthly limit. Choose your purchase amount and click “BUY.” That takes you to a sign-in screen where you can register your account. 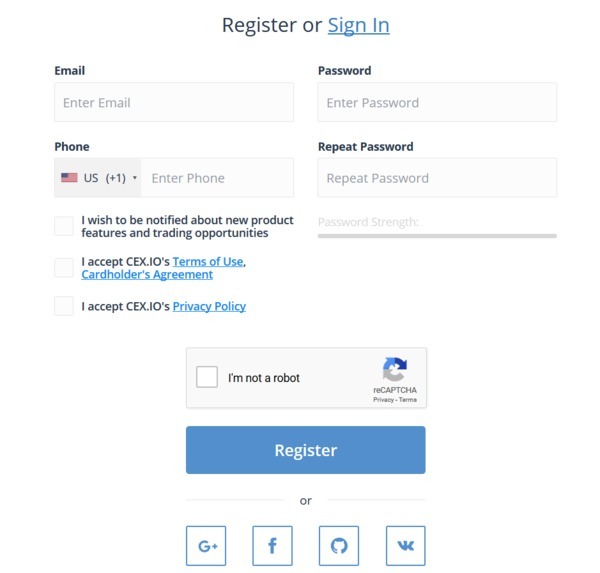 Once you fill in the registration information and submit it, you’ll receive several emails from Cex.io. One of them is an email confirmation which is used to verify your email address. You can click the link in the email to do so, or you can enter the unique code included in the email in the web form. Following the email verification, you’ll also be required to verify your mobile phone number by entering a code Cex.io sends to you via SMS. All of these steps are for your protection. After entering the card details, you will also be prompted to enter your address. The next step will ask you to take a selfie with your credit card. The selfie must be high resolution and no larger than 15MB. If it isn’t clear enough, the compliance department at CEX.io will ask you to submit another selfie. Part of the verification process is one with which you’re likely familiar. Cex.io will make a small verification charge to your credit card. 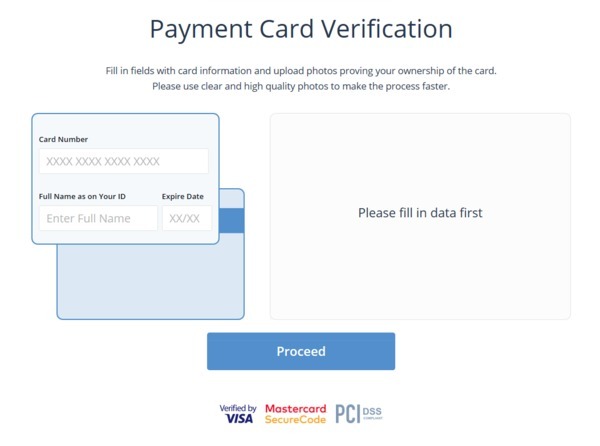 You need to enter the amount of this charge to complete the credit card verification process. Then, you can complete your credit card purchase of bitcoin. CoinMama, which is only available in some U.S. states, allows buyers that buy less than $150 in bitcoin to do so without loading a scan of an ID. 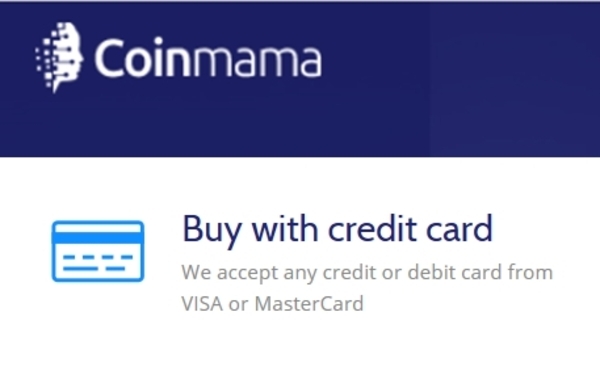 CoinMama charges a 6 percent transaction fee. CoinMama allows $5,000 in bitcoin to be bought per day. Log on and click “Buy Bitcoins” at the top of the page. Select “credit/debit card” as a payment method. Enter your billing information and address. Verify your phone number and email via text message. Upload your ID, if needed, and wait for verification. Cex.io is one of the top brokers for buying bitcoin with a credit card, but some people might be put off by their extensive identification requirements. If that describes you, then CoinMama is a great alternative with minimal private information required. CoinMama also allows users from some U.S. states that Cex.io doesn’t support. Another option for purchasing bitcoin with a credit card is BitPanda; however, they only support users from Europe. One final suggestion is to use Changelly. Note, though, that you can only use credit card payments with them if the credit card being used supports 3D-secure. These guidelines on buying bitcoin with a credit card could change rapidly. 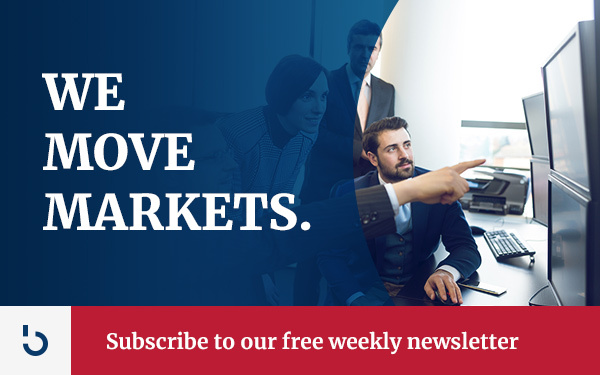 To be sure you have the latest information about bitcoin and other altcoins, subscribe to the Bitcoin Market Journal newsletter and never lose sight of what’s happening in the bitcoin landscape.